The Cambodia scenes has been cut out from the original version due to recent clashes between Cambodian and Thailand over the Preah Vihear temple. Chernang: [Repeated line] Your life depends on you. I saw this film last night here in Bangkok and I am pleased to relate that, despite all the alleged problems during production, Tony Jaa has delivered a very impressive film with a strong, mystical narrative; uniformly high production values; and, most importantly for a martial arts film, brilliantly conceived and choreographed action sequences. 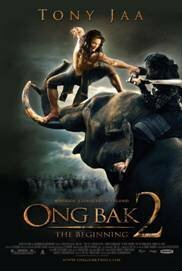 Despite its title, "Ong Bak 2" bears but a tenuous relationship to the earlier Jaa film, being an historical semi-epic set during the era of Ayutthayan imperial expansion (though, without wanting to give too much away, the closing sequence does suggest this new film can be regarded as a prequel of sorts, while also setting up the grounds for further entries to come), but it does explore similar thematic terrain as "Ong Bak" in terms of cultural identity and conflict, familial disintegration and revenge, and Buddhist spirituality. 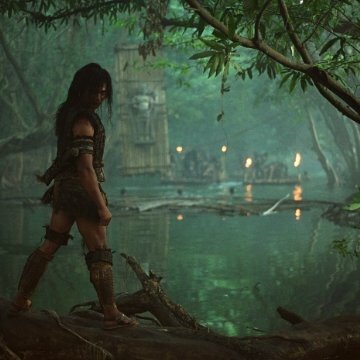 "Ong Bak 2" is a bigger film in every sense of the word, allegedly costing in excess of 300 million baht, and the money is easy to see on the screen with very impressive set design and costuming, and stunning cinematography. Jaa is terrific in the film: despite his incredible action scenes and lithe mobility, he projects a serene stillness through his character of Tien that gives the film a strong emotional anchor. As befits the type of mythic figure he is playing, he doesn't have a lot of dialogue but Jaa is essentially a physical performer, the Gene Kelly or Fred Astaire of contemporary action cinema, and he expresses himself with assured eloquence through his body and face. Indeed, in relation to the latter, while one expects corporeal proficiency and grace from Jaa, it's worth noting what extraordinary use he makes of his eyes in this film to convey a wide range of emotions. He really is a major talent and I do hope the producers at Sahamongkol realize what an asset he is to Thai cinema and start treating him with the artistic respect he deserves. My only slight criticism is that the film doesn't quite develop its central characters and plot lines fully enough. There's a certain cool distance about the film: it looks a visual treat and is a veritable masterwork in intricately choreographed martial arts film-making but, with the exception of one or two scenes, we never quite gain a sufficient handle on the main characters or come to identify with them and their plights all that deeply. It's clear that the producers are aiming to use this film as a base for further sequels and I can't help but wonder if they strategically held back some narrative material for use in the next film. Nevertheless, this is a minor qualification and doesn't detract from what really is a terrific film all round. 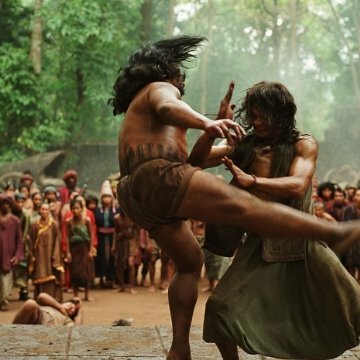 Given the negative press surrounding its production, I had concerns that "Ong Bak 2" might not come together but Jaa and the team have pulled off a very impressive effort, indeed, that deserves to do well not only here in Thailand but in overseas markets as well.